Written by Tami Blumenfield, Siobhán M. Mattison, and Mary K. Shenk. While tourism studies scholars debate the impact of tourism on indigenous people living in relatively remote areas, individuals, villages, government units and companies all over China are cashing in on these areas’ appeal to the newly affluent touring class. Opening the doors to tourists often means a huge influx of money, at least in the short term. The resulting economic changes and the presence of all these visitors can also bring about dramatic changes in social organization and family structure, as Xianghong Feng and Jenny Chio have pointed out in their books on rural ethnic tourism. A growing inequality between villages in tourist zones and those just beyond those zones often results, leading us to wonder how the effects of tourism – both positive and negative – are viewed across these regions. 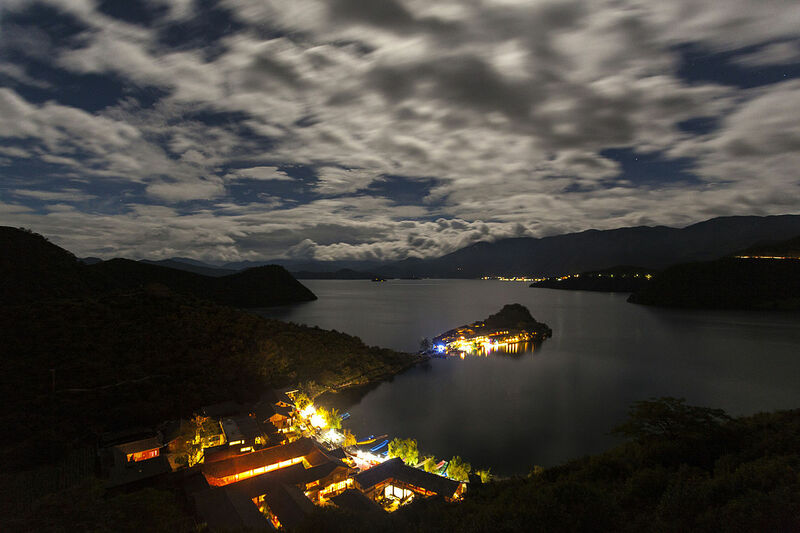 Tourism to southwest China’s Lugu Lake, an alpine lake tucked deep in the Hengduan Mountains at an altitude of 2650 meters, has been booming for over two decades in some lakeside villages, as has been discussed elsewhere (Blumenfield and Mattison). But in others, tourist visits have only recently reached numbers significant enough to turn most people’s attention toward hosting visitors. Villagers in those areas have not completely given up on farming, fishing, and raising livestock, but they depend less on these activities for their income than before. Meanwhile, young people in many of these villages have started returning. They previously worked outside their villages, in construction, in the hotels and restaurants of other tourist areas, or in other casual jobs that nobody expected would last a lifetime, but that offered better opportunities for earning money and seeing the world than staying at home. Now, though, with people from across China and around the world coming to their region and possibly even to their villages, young people see plenty of opportunities, both financial and otherwise. As part of a comprehensive research study examining the transition to a more market-based economy in rural southwest China, we interviewed people in twelve different villages in 2017. The villages fell into three categories: (1) uninvolved in tourism, (2) completely transformed by the work of hosting tourists, and (3) somewhere in the middle: somewhat involved with tourism, but not very much. Most villages were primarily home to Na people, who are also known as Mosuo or Menggu. In the four villages where other ethnic groups lived as well, we focused our interviews on Na families and individuals. We wanted to understand why people are eager to participate in tourism, despite the dramatic and sometimes disturbing changes it can bring. Surprisingly, very few people we spoke with commented on negative effects of tourism. Those who lived too far away from the lakeside tourist zones to attract tourists in any meaningful numbers were particularly vocal about their hopes for the interactions and income they thought tourism would provide. A few people in villages transformed by tourism, though, had different perspectives. One Luoshui man in his forties spoke of tourism as an active agent that had ‘wasted a generation.’ Suddenly flush with cash after their families had leased their guesthouses to outside entrepreneurs and given up most of their farmland, many of this man’s contemporaries had begun leading hedonistic lifestyles filled with drinking, eating, gambling and little responsibility. Their health was suffering: he and many others with whom we spoke noted that elderly people seemed to be in much better health than their children. All kinds of new illnesses, including what are known in Chinese as ‘the three highs—high blood pressure, high cholesterol, and high blood sugar,’ were having unpleasant and serious effects on people’s lives. True, they could afford to seek high-quality health care in cities they may not even have been able to reach before, but this did not help their health conditions very much. Health challenges were not the only unanticipated consequences of the tourism boom. Interpersonal relationships, too, had changed significantly. Where before people would help one another out without expecting direct compensation in return, by 2017, few people in the primary tourist zones remained willing to provide much help. They were often too busy, anyway. Some spoke longingly about the slower pace of life in previous decades, when everyone had time to chat with neighbors and visit with relatives. ‘I miss those days,’ said Lujin, perched on a stool next to her cousin’s hearth. (Her own home had been reduced in size to accommodate a restaurant expansion and no longer had its own hearth room.) She and her husband had built a new home away from the lake, but she still spent many days in the village. It was hard for us, spending several days filming interviews in a lakeside village where people commented sadly on relationships that had changed for the worse and noted their declining health through the diseases of prosperity, then going to a village that was in the early phase of reorienting itself to host visitors. Visitors could ride horses across the village plain, eat sumptuous meals cooked by Na families, and if they paid enough to cover stipends for all the villagers, join in evening dance festivities held just for them. The young village head, moving beyond the loudspeakers of an earlier era of village governance, had created a WeChat group to communicate with the other villagers. Many of them could not read, but they could listen to the audio messages and participate in plans for dancing festivities or other activities. People in this village still helped one another out, they still farmed and raised livestock, and they were still in good health. Was the extra cash really worth it? But of course, it was not our decision to make. And in any case, though we stayed in that particular village for a week, the only other outsiders we saw were tourists that our Lijiang friend brought over from the lake to eat one of those sumptuous meals. I worried aloud to their hosts, wondering whether the visitors were bothersome to the woman who spent entire mornings preparing those feasts or to her frail, eighty-year-old mother. ‘They’re not bothersome (mafan)!’ Sona replied, eyes twinkling. She was proud that they enjoyed her cooking, even if they could not always manage the fatty pork. The fifty yuan (about $8 US) that each person paid for the meal brought an infusion of cash that her family really needed in the increasingly cash-based economy. And Sona’s mother loved hosting them. Besides, groups only came three or four times a month—not enough to make a major difference in their routine. There was talk in the village of finding an investor who could build some guesthouses and provide more infrastructure for visitors. In the meantime, villagers like Sona remain primarily occupied with non-tourism-related tasks, and analyzing the significant transformations in village life requires looking beyond tourism to other reasons for economic and social change. With a provincial border running right through the lake and through the region, this zone is uniquely positioned to shed light on how local and regional government practices vary. From their different approaches, we can also see how policies affect the people and families living along the lake’s many kilometers of shoreline. Different sets of policies are in place on the Yunnan and Sichuan sides of the lake to protect ‘Moso culture,’ build infrastructure, and address ecological challenges brought by an influx of tourist visits, and we are exploring their effects. We hope those involved with promoting tourism will listen to the voices of those already affected by it, whether directly or indirectly, as they make plans for future expansion. Perhaps then villages like Sona’s can find that elusive balance as they welcome more tourists, meeting their monetary needs without sacrificing their health and well-being in the process. This article is based in part on research supported by Awards BCS-1461520, BCS-1461514 and BCS-1461522 from the U.S. National Science Foundation for the project, “Collaborative Research: A multidimensional investigation of the dynamics of market transition and social change in rural China and Bangladesh.” Any opinions, findings, and conclusions or recommendations expressed in this material are those of the authors and do not necessarily reflect the views of the National Science Foundation. We thank the individuals who assisted with our research and took time to share their perspectives with us. We especially thank Melissa Kuester for her contributions to the research. Tami Blumenfield is Assistant Professor of Asian Studies and Co-Chair of Women’s, Gender and Sexuality Studies at Furman University. Siobhán M. Mattison is assistant professor of anthropology at the University of New Mexico. Mary K. Shenk is Associate Professor of Anthropology and Demography at Pennsylvania State University. Image Credit: CC by Evilbish/commons.wikimedia. Names cited in this article are pseudonyms.